(SEL85F18). Sony FE 85mm f/1.8 Lens (SEL85F18). FE 85MM F/1.8 LENS. Front Lens Cap. Rear Lens Cap. Diaphragm Blades. CANCELLATION POLICY. LOST PARCEL AND DISPUTE CASES. For sale Sony E 55-210mm f4.5-6.3 OSS Lens as new. Suiting the appropriate light-gathering abilities is an excellent optical design, which integrates 3 aspherical elements as well as 2 extra-low dispersion elements. One of the aspherical elements showcases an XA (extreme aspherical) designation, guaranteeing its polished surface area accuracy and also significant capability to decrease round aberrations throughout the zoom range. Furthermore, a Nano AR coating has been put on specific components to considerably reduce lens flare and also ghosting for enhanced contrast and shade neutrality. 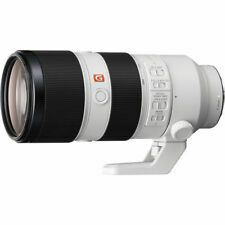 FE 70-300mm f/4.5-5.6 G OSS Lens for E-Mount SEL70300G. Linear Autofocus Motor. Front Lens Cap. Rear Lens Cap. Minimum: f/22 - 29. 2.95' (90 cm). Our warranty covers labour costs for repairing the faulty unit. 100% New. 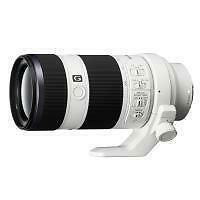 SONY FE 70-200mm F4 G OSS Warranty. 1 x SONY FE 70-200mm F4 G OSS. SONY FE 70-200mm F4 G OSS. Picture may be different than actual product! No LocksLooking for a new cell phone but afraid you might lose your old phone number?Buy from Perfect_mission and avoid the risk as this item is free of Service Provider locks (For the network frequencies coverage. ). Trending at AU $1,751.23eBay determines this price through a machine-learned model of the product's sale prices within the last 90 days. Model Number: SEL100400GM. (Sony SEL100400GM). A precision optical design ensures consistently high corner-to-corner resolution at any focusing distance throughout the lens’s zoom range. Fast, tenacious autofocus. Trending at AU $3,398.20eBay determines this price through a machine-learned model of the product's sale prices within the last 90 days. FE 90mm f/2.8 Macro G OSS Lens SEL90M28G. Also, it has a Nano AR Coating that suppresses reflections and allows for efficient light transmission for clear photographs. 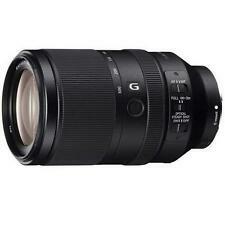 Sony FE 90mm f/2.8 Macro G OSS Lens. The SAL18135 is the lightest mid-range zoom lens on the market. Lens mount Sony A-mount. Refurbished: This item is manufacturer refurbished, has been professionally tested and approved by Sony. Lens Specifications. 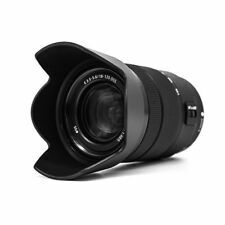 FE 85mm f/1.4 GM Lens for Sony E- Mount SEL85F14GM. Characterized by its flattering perspective and fast f/1.4 maximum aperture, this lens is adept at isolation focus for shallow depth of field effects, as well as performing in low-light conditions. Sony FE 85mm f/1.8 Lens. ALC-F67S 67mm Front Lens Cap. R1EM Rear Lens Cap for E-Mount Lenses. ALC-SH150 Lens Hood. Get 7% off in checkout page with coupon code: PRESS. MINIMUM APERTURE: f/22. Trending at AU $911.31eBay determines this price through a machine-learned model of the product's sale prices within the last 90 days. Sigma’s own proprietary OS (Optical Stabilizer) system enables handheld close-up photography. A Special Low Dispersion (SLD) lens and one. It is also possible to use this lens with Sigma's. Filter Size (mm). (Sony SEL70300G). Check out the Sony FE 70-300mm F4.5-5.6 G OSS Lens's Key Features. Sony FE 70-300mm F4.5-5.6 G OSS Lens. The first E-mount zoom to cover a 70mm to 300mm range is a versatile image-making tool that can handle a wide range of subjects, from portraits and scenery to sports and nature. This 100mm mid-range telephoto prime lens is a superb creative tool that offers outstanding G Master resolution plus innovative STF (Smooth Trans Focus) optics for magnificent bokeh. It features fast, precise, quiet DDSSM autofocus, and close-up capability up to 0.25x magnification. Built-in Optical SteadyShot image stabilisation minimizes blur that can occur during low light or macro shooting. Advanced optics and design achieve extreme resolution and absolutely breathtaking bokeh that combine for overall performance that epitomizes the G Master concept. This lens has been specifically designed to produce extraordinarily smooth, natural bokeh without vignetting. The result is naturally immersive depth and dimensionality. This lens is constructed of 16 elements in 13 groups, as well as 3x Extra-low Dispersion (ED) glass elements, which all help to deliver sharp, clear photos throughout the zoom range. It has a minimum focusing distance of 1.5' and a front-end filter diameter of 77mm. The lens' maximum aperture is a fast f/2.8 and can be maintained throughout the zoom range. Its minimum aperture is f/22. It also has 9 circular aperture blades that work to produce smooth, out of focus background effects. This lens has a 2.9x zoom factor, and its 24-70mm focal length range is equivalent to 36-105mm in APS-C format. The maximum aperture is f/2. Lens conditions is unused, no marks on glass or body, check on my Sony Alpha 65.